It official, I am painting again. Not only is this the first miniature I have painted this year (very sad, I know) it is the first miniature I have painted from Reaper's second Bones kickstarter! I didn't really think about that until after I was nearly finished, not that it really matters. This is also my first official painting post for 6MMRPC. I did mean to take before & WIP photos but I got in the zone and completely forgot - sorry! So, I am trying to be more diligent in link the model for people who are interested so, this is one of the models in the Animal Companion pack. I was really nervous when starting this miniature, it made me think of what my high school art teacher referred to as 'blank canvas fear'. However once I got started I really enjoyed myself and got the painting done (not the base) in one 3 hour sitting. I did do some research before I started & decided to roughly paint him similar to a sun bear. They are the smallest of the bears (that is a medium base - 1"), and it could pass for a number of other varieties of bears. I also thought the pale face & chest spot would bring in interest. The base was made out of cork & sand, while the dark green bushes are made from foam. The turf mix & grass are from a Secret Weapon set and the fern & mushrooms are from a Busch Fern and Mushrooms set. I was aiming for a mountain forest feel, and I think I managed that. I always try to create a base that sets a scene or brings the miniature to life without overtaking it. and I think I managed that with this base. 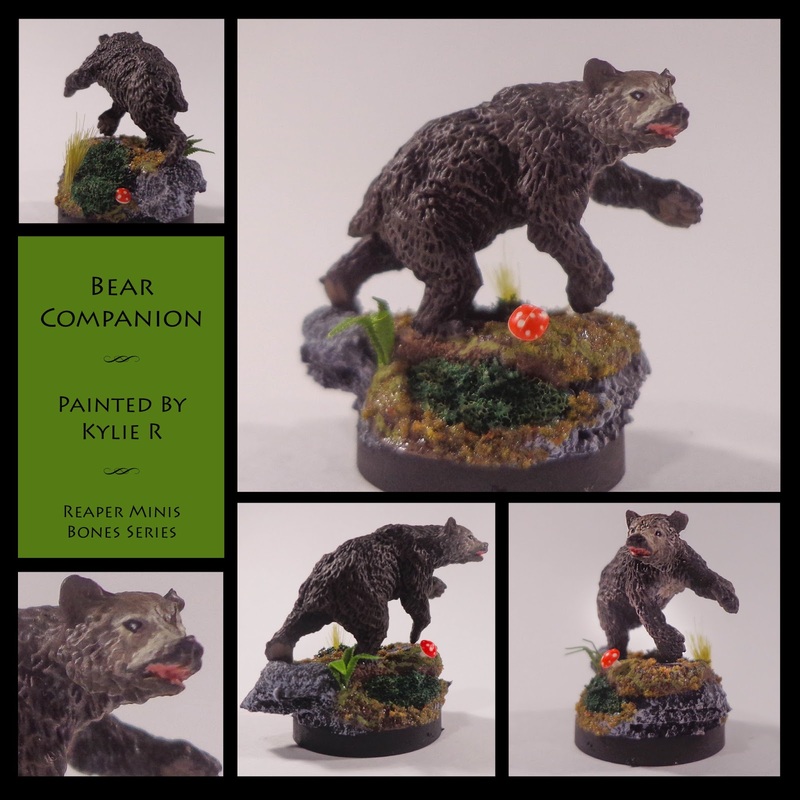 I wonder if I should have used a brown mushroom on the front as the bright red takes the eye away from the bear a bit, but that seems to be the photos. Overall I am really happy with the result, I always think that when I have a long sabbatical from painting that I will lose most of my skills, so my expectations were low. But I am extremely happy with how he turned out - even more so in person, I really am not happy with the photographs. Thanks for all the info on your basing materials, I was curious. I like the red mushroom, it injects some unusual colour into the piece, but is small enough not to be dominating. Thanks - I will try to remember to photograph WIP during basing to show better what I do. I basically built the base with cork & added the bear (just glued it on broccoli base & all) and then added the sand using the same method I described here (http://dabblesminis.blogspot.com.au/2014/08/basic-bases.html). Once it was dry I added the foam & painted.